Despite a decent resurgence this past year, it looks fairly certain that ER will be ending next spring after 14 seasons. While it’s not a certainty, producers want to make the drama’s swan song a family reunion. 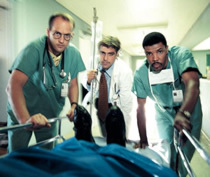 ER debuted back on September 19, 1994 on NBC as a two-hour pilot. The hospital-based drama was an immediate success and helped to launch a cast of future stars like George Clooney, Anthony Edwards, Eriq La Salle, Julianna Margulies, Gloria Reuben, Sherry Stringfield, and Noah Wyle. Though it’s highly unlikely that you’ll see Dr. Greene walk through the doors of County General anytime soon (remember he died in season eight), the producers are inviting back just about everybody else. Dr. Carter (Wyle) is already set to return for a few episodes will be in Chicago to check on the hospital’s Joshua Carter Center — as well as for a medical concern. Producers are hoping to also bring back Thandie Newton who played his wife Kem. The two split shortly after they’d lost their baby, before Carter left the hospital . The show’s executive producer, David Zabel, told TV Guide that they’ve also talked to Reuben and Margulies about making returns. He said, “Julianna’s doing a show now (Canterbury’s Law), but we can always write a story that can shoot in a couple of days.” Zabel is also hoping La Salle, William H. Macy, Sally Field and Danny Glover will be able to revisit the hospital. Laura Innes and Shane West, who both departed last season, are also distinct possibilities. Zabel would especially love to have Clooney back on the show and jokingly said, “We’re always thinking of ways to bring Dr. Ross back on the show. And now might be a good time, because I hear George needs the work.” Stay tuned! Horrorfying news! Well we can’t do anything about it. Just cry. These are the reasons I hate comitting myself to a show. At least this was on for a long time. ER-the best T.V show. No other can compare. This will affect me. I love the actors. I do agree, we will all have to seek professional help to recover. Please keep the repeats running! At least. I absolutly love this show. Me and my dad watch it every thursday and we are very sad it is ending soon. I cant believe they killed off pratt. Completely unneccesary, i love watching er. I even got my husband into it 4 years ago when we got married. truly will miss it. I hate like hell that you killed off the strong Black man on ER, left the viewing audience with the GAY brother (Whoa, no where for the Black women hearts to throb) and then replaced him with the strong Black woman. Yeah, media and writers we DO GET IT!!! And still Er manages to not ever cast an Asian male doctor. Better take a look at a real major city ER and see who works there. What a disgrace. I fell in love with ER 7 years after it began,the following 7years for me has been nothing but must see TV.I can watch another 7 years.